I’m really thrilled about the interest that Gilding the City is getting. To date since it’s launch (on the 2nd of Jan 2012) I’ve sent off around 20 pieces to cities around the world. And closer to home, there should be one appearing in the tiny town of Mia Mia in Victoria any day now. I’m really humbled that this idea has gone so far, so fast. And it’s awesome to be able to introduce a whole new bunch of people to the idea of Turnup Stuffing. 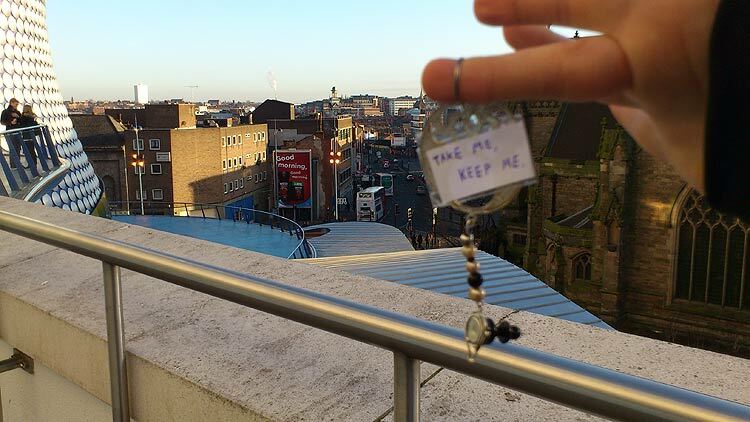 A lady who emailed me yesterday included a photo of a bit of jewellery she’d found that day on the streets. How inspiring is that? I was in town the other day and I decided to go take a quick visit to a couple of the sites where the Gilds were installed, to see if they had lasted. I’m sad to say that LINKS were all gone, but oddly enough the two down Hosier Lane, one of the accepted graffiti lanes in Melbourne, were still there. I’m assuming that the others were cleaned away by official council cleaners, if it were people taking them then the ones down Hosier Lane would have been gone too, and it’s a strange thing to think that there are places in the CBD where street art are clearly acceptable. You would think that it would be an all-or-nothing policy but clearly it isn’t. It does make me think that if I want the pieces to last, that I should put them down the graffiti lanes, Degraves St, Hosier Lane, Croft Alley and the like. One of the reasons I’m doing this project is that I want to present work straight to the general public. Speak to the person in the street, literally. I have found that work in galleries are only seen by people who go to galleries. If you want to talk to people outside that sphere, you need to take the art to where those people are. Some of those people walk around the Melbourne CBD and so that’s where I want to put these tiny pieces. Gilding the City says a number of things. It tells people that I think the city is beautiful. It tells people that I think enough of the city to spend some time creating decorations for it. It tells people that not all of the trash that litters the streets is useless. It tells people that just because things are broken doesn’t mean theyre not beautiful. Gilding the City also rewards people for looking around at their city. It encourages them to look again at walls and buildings that have become so familiar that people no longer see them properly. It also reminds people that not all street art is painted up on the walls. And it takes a stand for street craft, which has been almost completely represented by yarn bombing, up until now. These are some of the reasons and meanings behind Gilding the City, apart from the obvious one that making jewellery for the city is fun. One of the recipients of a Gilding for Portland asked me if I had any preferences for where of the type of location to install a Gild. That made me think, do I? But I don’t think I do, not instructions to give out to the others anyway. I see Gilding the City as a collaboration between myself and the installers. I give them freely each piece and they can put it where they please. I was going to say that I don’t really plan which ones go where, but that’s not strictly true. My first ever Gild was specifically placed outside Craft Victoria, and it was one of my favourites, Victorian Mourning Brooch. Bringing back the street craft, one piece at a time. They were closed at the time for the January break, so it might not have even been there by the time they got in, but it was symbolic, creating something beautiful and leaving it outside for them to find. Some of the Gilds are placed because their size or shape is aesthetically pleasing in the chosen setting. Some are placed in certain spots because of the symbology involved, or that the theme seems to suit the surroundings. And some are just placed because there was the opportunity to do so. This all leads me back to placement down graffiti alleys. If I limit myself to those, then the Gilds will stay longer but wont reach as many people. If I put them out on the streets where everyone can see them, they will only be around a shorter period of time. Either way, I’m limiting the amount of people who will be able to see them. So what to do? I feel this is the ongoing dilemma of any artist who has ever installed their art on the streets. The most sensible thing to do is not worry how long the pieces will stay and instead continue along in the vein I’ve been doing it in, which is placing them in both types of settings, as they fit. Next post: Gilding the City yarnbomb mashup!